This addon will give you the ability to change your mount depending on your current location (zone). e.g. use a camel in the Alik'r desert, and a horse in Stormhaven. In addition the addon is able to block your horse training skills. You are able to level only one specific horse training until it's maxed out this way, without clicking a wrong training button by accident. Your chosen mount will be used if you do a /reloadui or any other loading screen in the zone. You need to unmount if you change a zone without a loadscreen/reloadui in order to mount on your desired subzone mount! -Disable the train feed, train, speed, train carry buttons at the stable. Changing your mount via the collectibles is not saving the current mount for the given zone! 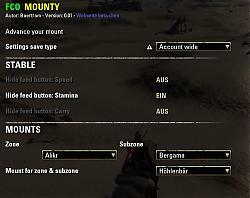 You have to open the addon settings via chat command /fcoms (or manually by pressing ESC key, and then navigate to the addon settings of FCO Mounty) and click the button "Current zone". The zone and subzone (e.g. a city at the current map) will be selected in the dropdowns and you can choose your mount for that zone + subzone now. If you want to set a mount for the whole zone (map) just change the subzone dropdown to "-ALL-". The addon will detect a sub-zone change not automatically (only if you do a /reloadui or are coming from a loading screen). So if you are mounted and ride into a new subzone (a city e.g.) it will be recognized if you unmount. If you are not mounted it will be recognized if you switch your weapons and are not in a fight. I could implement some more checks but it will be checked quite often then (e.g. via ability events). SO for now this should be enough checks. What zone and subzone am I currently in? It will show you the zone and subzone name in teh chat. Only if the subzone changed the mount will be changed on unmount as well! If the subzone of a map is always the same you got no way to differ in it and set different mounts This is due to the game's API functions and not an addon problem. You need to install them as standalone versions! Check the description for information what a library is, what a standalone library is, what other addons are helping you to see the dependent libraries of an addon, and how you are able to install them properly as a standalone version. Fixed: lua error message pressing "Current zone" button for missing zone/subzone pairs. This applies to the mount enhancement settings. If no zone/subzone data is found it will use the current standard ESO settings for this zone/subzone and add it to your settings automatically so you are able to change it. Added "debug" setting (standard: Disabled). Only if you enable this setting you will see chat messages about missing zone data. So be sure to enable it if you want to support me and tell me where zone/subzone data is missing. Thank you. Fixed version number. Should be a string. Thanks Ravenmind! Fixed lua error message while using "Current zone" button. -The addon will disable itself automatically within dungeons, raid dungeons and delves, if it can detect them, to speed up game loading (as most dungeons do not allow you to mount, and those where you are still able to mount will use your last used mount then). -Changed the zone names and subzone names in the settings dropdown boxes to show "client language dependent" entries using LibZone (please download and install this library so the addon will work properly!). -> Check the addon description about "how to download and install standalone libraries properly". Fixed error message for unknown zones / subzones. The chat will show a message about this now. Feel free to contact me via the addon comments or pm so I can add these zones, if they are needed AND if you can mount in this zone! If no mount is possible then just ignore the chat message please. Updated API and removed libraries. You need to install them as standalone versions. Added: Function to print the current zone and subzone to chat so you can specify me some information if another zone is "missing" in the addon. Write me a PM or an addon comment with the chat output and I'll add it to the addon. 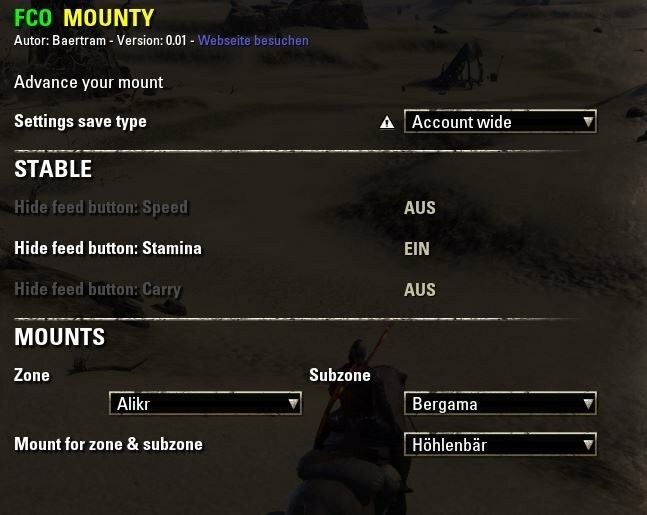 -Added "preset mount option" to set the manually chosen mount from your collectibles as the standard mount for the current zone & subzone. The option is turned off by default. -Added events for unmounting, weapon change and switiching to mouse mode (talking to NPCs e.g.). Aren't there already addons doing this or available to change your look etc.? I guess pets would fit in there as well then. I found a few and tried them out. There is only one working, Style an Elegance. However, this is a) much more than I need and b) not switching automatically. You set up complete sets with clothing, jewelery, hair, body and face marks, mount and much more, but the pet is missing. I think it's perfect the way it's done here: autochoose your mount by region. a camel for the desert, a senche for Grahtwood. It makes sense. And it would make sense to have a senche pet running behind you and your senche mount, but not behind you and your mechanoid or dwemer mount. Anybody has a solution for that? The names of the AddOns I found were very "pictorially" and in different categories. Perhaps I missed one I could use for that. Nope, not in this mount related addon and I'm not planning to build new addons. I got hardly time to play. But these are only chat messages, no lua error messages, right? Simply ignore them. They are just there to inform you that no zone data is given for the current zone/subzone. If you get the messages copy them in total from the chat (you can use the addon pChat to right click the time stamp and copy the text) and post it here to the comments of the addon. If it's Wort the effort I might add them then, or exclude the area like dungeons/bgs. "Zone: battlegrounds (id/parent:510/849), subZone: -ALL-"
"Zone: battlegrounds (id/parent:514/514), subZone: -ALL-"
"Zone: battlegrounds (id/parent:512/512), subZone: -ALL-"
The message may be different in different BGs. I can add as i find them. Some BGs (a very few) you can mount in, most you can't. Last edited by Atola : 02/13/19 at 07:09 PM. If i'm mounted and I manually go to collections and select a different mount - the change does not take. I assume you did enbale the option to use the mount from collections for the current subzone upon manual mount change from colletions. It can only work this way: It should unmount you on selecting the other collection mount, and then as you mount again on the new mount it will update it to the current zone. Unmounting and selecting another collection WITHOUT mounting on the new mount wont change anything as the addon needs the trigger "mount" for it (not unmount and do something with collections; could even be you do something with a colleciton which is no mount at all ). I'f i'm not mounted then do a manual change - the change is set for the add-on as expected. Yep, this works as designed. Manualy change of the mount from collections or whatever way you do to change the mount won't affect the total zone, if the setting for the total zone is enabled. The total zone checkbox is only meant to work for the selected mounts within the LAM settings of the addon! Last edited by Atola : 02/12/19 at 08:06 PM. What behavior should i expect in BGs? I disabled this a while ago because in BGs i was getting errors - and the game seems to wig out occasionally when addons do things upon load of a BG area. For those of you who do not want to edit the files manually and do not want to see the message in total just disable the "Debug" settings of FCO Mounty now. I can recommand the addon pChat which makes it able for you to right click chat entries (on the added timestamp of the message) and copy the lines to a popup where you can use CTRL+C to copy it to your clipboard! [FCOMounty] The current zone data is missing. Please contact @Baertram ingame (EU server, via mail) and write him a PM, or an addon comment. ->You are able to open the FCOMounty addon comment website at www.esoui.com via the FCOMounty settings: ESC->Settings->AddOn settings->FCO Mounty->Visit website! It happens in a few other zones as well but I spend a lot of time in Vivec City so I really noticed it there. It shows up every time I interact with an NPC, bank, crafting station, etc. Same, though without the LUA error. I haven't taken a lot of notice because I keep those messages in a chat tab I rarely use. However when I switch over to it I find an absolute deluge of those messages. Also most often in/around Vivec, as well as other places. Wow, thanks for the quick update! It's working perfectly again. I've got debug mode on and will definitely post anymore missing data I find. Just released an updated version, thanks for letting me know. Please enable the new "Debug" setting within the FCOMOunty settings menu (chat command is /fcoms) so you'll see those chat messages again. You're right. I guess I just 'ignored' it because I assumed there was something up with my saved variables and didn't want to bother you with something on my end. Woops! I'm able to add it to the addon and the message won't happen again "for this area". So collect the data and send it to me and I'm able to help, like written in the chat message. I'll test it within Vivec city to see why it still happens. Seems to only happen if you press "Current zone" in a not added region + subzone. Last edited by daxterjax : 12/09/18 at 10:16 AM.